Before beginning beekeeping, first ask yourself : What kind of beekeeper do you want to be and why do you want to start beekeeping? The reason you should ask yourself this question is that it may determine the kind of hive you decide to use, the practices you adopt, and even possibly the kind of beekeeping association you decide to join, depending on where you live in the world. To an extent, your own personal circumstances and living location may also play a role. Also, those beginning beekeeping have a variety of reasons for doing so. Certainly, in some countries such as the UK and USA, we have witnessed significant increases in the number of people wishing to keep bees. Whereas in the past, it's probably true to say it was mostly for the honey, but nowadays, for some it is due to a concern for bees. In many cases, this is partially due to the news reports about Colony Collapse Disorder, and people people wanting to do their bit for the honey bee. However, for some, beginning beekeeping is about self-sufficiency, and the desire to produce one's own food. A number of different bee hinves are availlable. You can, if you wish build your own. Kits are available. So here, I’ll list just a few reasons for people wanting to keep bees (although, I’m sure there are more!). So in each case, which statement applies to you most – statement A or B? B.	I'd like some honey, but I am concerned about the welfare of the bees, than the harvesting of honey. B. I would rather keep synthetic chemicals and pesticides away from bees, and use natural treatments and preventative practices instead. A. Humans know what’s best for bees – not the bees - we have to trust conventional practices. I'm concerned with honey production. B. The bees know best. I’d like to support their natural behaviour, and the way the bees themselves prefer to organise their honeycombs etc. A.	Beekeeping is becoming popular these days. So I thought I’d get a hive or two, and get some honey. B.	I’ve heard about the plight of bees and bees disappearing. I thought I would try and help by keeping some bees. A. In general, I lean towards chemical use in agriculture and gardening. B. In general, I share more the ideals of organic and/or wildlife friendly agriculture and gardening. If you answered mostly B’s, it may suit you best to take a look at Natural Beekeeping and Organic Beekeeping. In that case, view the resources on this site. This site only promotes Natural Beekeeping and Organic Beekeeping practice – albeit, there are different levels of these practices, and there are some who opt for conventional methods but do also employ some aspects of Natural and Organic Beekeeping. But why am I promoting Natural Beekeeping and Organic Beekeeping? The reason is that they combine a number of key principles that I feel are very important. Firstly, I favour organic methods generally, and the organic way of living, organic gardening, farming and so on. With regard to Natural Beekeeping, I also like the idea of keeping bees in harmony with the natural behaviour patterns of the honey bees themselves (such as in the way they construct their honey combs etc. At the same time, it advocates far less interference with the bees than is encouraged by conventional beekeeping practice. (Although it should also perhaps be said, that technically, as soon as a bee hive is introduced, it is beekeeping - and so in a sense, 'artificial' or 'domestication' - rather than allowing bees to build their own nests in a natural way, in a site of their choosing). One of the most important features for me, however, is that synthetic pesticides and chemicals are avoided, and there is a strong leaning toward the organic way of life. The main focus behind Natural Beekeeping and Organic Beekeeping is not necessarily honey production, though of course you may harvest some. In fact, if conditions dictate during less abundant years (perhaps due to poor weather, decline of foraging opportunities for the bees), some natural beekeepers will leave all the honey for the bees. Of course, they do at least benefit from the pollination service these little creatures provide. I know this approach may not suit everyone, but as for me, I prefer to promote the methods I feel resonate most with my beliefs and concern for the bees themselves. By the way, Natural Beekeeping can also be started at a relatively low cost, because there is less interference with the bees using man-made procedures and equipment. If you are inclined toward DIY, it is possible to build a hive yourself, using these honey bee hive plans. Link to main beekeeping section with links to other beekeeping topics on this site. Link from Beginning Beekeeping to this page looking at some of the key principles of Natural Beekeeping, with more links to further information. Link from Beginning Beekeeping to this brief introduction to some of the honey bee hives available to buy or construct yourself. 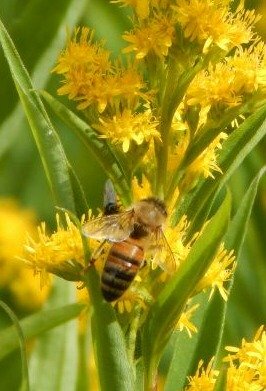 Link to lists of nectar and pollen rich plants for bees.